Have you ever wanted to learn how to do time-lapse photography? A new e-book from Ryan Chylinski gives a complete introduction to shooting, processing and rendering time-lapse movies with a DSLR camera. 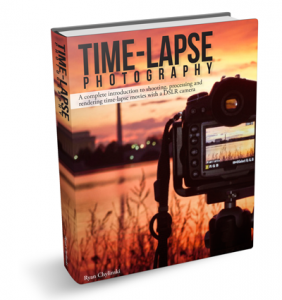 The guide covers the art and science of time-lapse photography and contains both detailed explanations and immediately actionable summaries in a colorful easy to understand and fun to read package. It also walks through three separate rendering workflows that touch different ends of the cost (both free and not so free), functionality and time-to-learn spectrum. Rather than summarize what’s inside Click here and you can see the table of contents and some snippets from each chapter. The first 20 pages are shown for review and free download.